Partake in this exhilarating runner game to feel the ultimate speed and challenge your agility! Try to avoid the barriers, go through the magic tunnel, jump over the space bridge. X runner is on the go. The application has been developed by the DroidHen and this application is both paid and also a free application. The download file size is 16.29 MB also crossed the 5 millions of downloads. The paid ranges from the 105 to 2643 rupees per item. Take to the streets with ANGRY GRAN RUN! Our Granny has been locked away in the Angry Asylum by Fred the agent in white, she’s plotting her escape, and she needs the user to guide her through the streets once she’s busted out! Run, jump, dash and slide over and around tons of different and WACKY obstacles in this crazy new endless running game. It has been designed by the Ace Viral and the download file size is 24.69 MB also with the download more than 5 millions of users. The application is both paid and free the paid varied from 59 to 6231 rupees per item. Dash as fast as you can. Dodge the oncoming trains. Help Jake, Tricky & Fresh escape from the grumpy Inspector and his dog. It has been designed by the killer had crossed more than 500 million downloads and file download size is 60.10 MB. It is the application both free and paid the range starts at rupees 55 to 5500. ★ Grind trains with your cool crew. ★ Colorful and vivid HD graphics. ★ Lightning fast swipe acrobatics. ★Challenge and help your friends. Horse runner games specially designed for kiddies with tons of passion for games with horses. rather it’s not only a game for children and kids but also for girls and game lover’s that is been built as a spectacular Android mobile game. This exciting and adventurous “horse runner” game is the game you kiddies and girls have been waiting for. so tie yourselves up to the ‘horse lovers’ and start playing this dashing horse game totally designed with attractive and dreamy backgrounds, grasses, and obstacles like cliffs, broken grasslands. It is a real unicorn game that girls and children will love to play in a heavenly environment with great graphics by covering distance, collecting moons, jumping and avoiding obstacles and unlocking more and more horses like ‘list’ and more of your Favorited. It has been designed by the Parzival games and the download file size is 12 MB with the 10 thousands of users. This application is designed by Imangi Studios has the crossed with over a 100 million downloads, and user prefers Temple Run redefined mobile gaming. Now get more of the exhilarating running, jumping, turning and sliding you love in Temple Run 2.Navigate perilous cliffs, zip lines, mines and forests as you try to escape with the cursed idol. How far can you run? The file size is 57 MB is the free and paid application ranges from Rupees 65 to 6662. 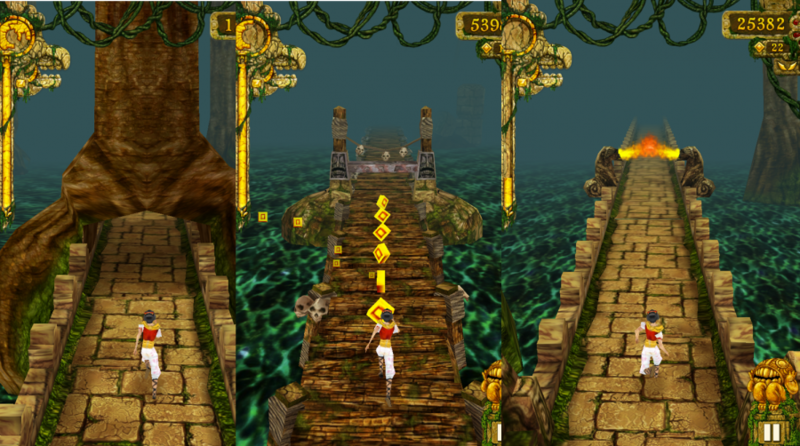 The addictive mega-hit Temple Run is now out for Android. All your friends are playing it – can you beat their high scores. You’ve stolen the cursed idol from the temple, and now you have to run for your life to escape the Evil Demon Monkeys nipping at your heels. Test your reflexes as you race down ancient temple walls and along sheer cliffs. Swipe to turn, jump and slide to avoid obstacles, collect coins and buy power ups, unlock new characters, and see how far you can run. Created by Imangi Studios has been crossed 100 millions downloads. The application download size is 53 MB with the rate varied from the rupees 53 to 1070. Vector is an exciting, arcade-style game featuring you as the exceptional free runner who won’t be held down by the system. The game opens with a view into a totalitarian world where freedom and individually is nothing more than a distant dream. But the heart of a free runner is strong, and you soon break free. Run, vault, slide and climb using extraordinary techniques based on the urban ninja sport of Parkour all while being chased by “Big Brother” who’s sole purpose is to capture you and bring you back. Inspired by the practice and principles of Parkour, Vector’s intuitive controls please players of all levels, and sophisticated level designs challenge the most demanding players with fast-paced timing puzzles as the traceur “flows” over the dystopian rooftops. This application has been developed by the NIKKI with the file download size of 87 MB. Price varied at rupees 52 to 265. Speeding Up, Jumping and performing various tricks in the air and landing safety. The game “BMX Boy” is so easy but super fun. You only need to accelerate or jump over the obstacles on the road and get the scores as possible as you can. The way to play is very easy. Tap the two bottoms on the screen (The right one is accelerating and the other one is jumping).Show some cool tricks in the air can get extra points. Runner game with the file size of 8 MB. Speeding Up, Jumping and performing various tricks in the air and landing safety. The game “Skater boy” is so easy but super fun. You only need to accelerate or jump over the obstacles on the road and get the scores as possible as you can. The way to play is very easy. Tap the two bottoms on the screen (The right one is accelerating and the other one is jumping).Show some cool tricks in the air can get extra points. Developed by Runner game of file size 8 MB. One who knows the darkness shall learn to live in the light since darkness and night are mothers of thought. This 2d side scroller challenges your skills, which you have built up till now in all the platformer games. Say no to the repeating tracks of the usual infinite runner games; the same stick runner track’s time is over now. Here is the new silhouette environment which requires your deep attention for running through the hurdles on the way besides collecting coins and using your parkour moves for jumping over the rooftops. These hurdles are always placed randomly on the track so that you don’t face the repeating obstacle placement in the track. Watch the speed getting higher as you progress through a level and see how far you can make it. Show off your score to your friends and challenge them to beat you in this ‘’not so easy’’ game. Developed by Red Gravity of file size 6 MB. • Amazing vector style graphics and real-time arcade animations. • Run over the endless unique track with different obstacles placement, every time you replay any of the game levels. • Decide on the spot whether you need to collect coins or avoid for the upcoming hurdle. • Dash through multiple unique tracks available and unlockable. Unlock the mystery of the Maze and race to survive in the official The Maze Runner game. Join the community of Gladers are trapped in the center of an ever-changing deadly maze. Run for your life while dodging falling boulders, fiery pits, and gushing aqueducts! Collect clues to unlock the Maze and completely new levels. Choose your runner for speed and stamina, and race the clock to escape before the Maze seals shut. Enter the world of The Maze Runner, the new film based on the best-selling novel. The application has been developed by the PIKPOK of file size is 105. The rate is varied from the ranges of rupees 190 to 1850. · Intuitive touch and tilt controls to Run, Jump, and Slide to safety. · Play as your favorite runner from the Maze Runner film. · Explore the Maze, Collect hidden clues, and unlock new Levels. · Race the clock and get to safety before the Maze seals shut. · Rewards and Daily Gifts for loyal fans. Lara Croft Relic Run is the all new action adventure for nostalgic Lara Croft fans. When a shadowy conspiracy threatens the world, only Lara Croft is equipped to unearth the truth. Run, swing, drive, and swan dive your way through beautiful and challenging environments, uncovering ancient relics to discover the truth and solve the mystery. There’s no time to waste, but how long can you survive. Designed by the SQUARE ENIX of the file size of 81 MB. The rate varies from the rupees of 10 to 3100. · Endless mode for nonstop action and the chance to rack up big rewards. · Outsmart and sabotage your friends by Cursing their Relic Run Each location features unique gameplay elements and brand new challenges. The game for girls. In the game, you have to help the princess get into the castle. It will have to overcome all the zigzags. We’ll have to hurry, the bridge collapses. Developed by princes’ game of 5 MB file size. For mobile and tablet. How far can the world’s fastest hedgehog run? Play as Sonic the Hedgehog as you dash, jump and spin your way across stunning 3D environments. Swipe your way over and under challenging obstacles in this fast and frenzied endless running game. Developed by SEGA of file size 69 MB. 55 to 6753 rupees is the prices ranges. Bus Rush is an amazing running game for Android. Developed by the play 365 of file size 48 MB varies with the price of 65 to 5300 rupees.Run the craziest scenarios in the Bus Rush City. Drag to jump or slide and to move left or right. Avoid hitting trucks, buses and subway trains. Run around the Bus Rush City, subway, forest, and beach and gather all the coins you can. In this exciting runner game, you can choose among 10 different characters to play with. Surf the Bus Rush City with Roy, Zoey, Darryl, Katie, or any of your favorite characters. Also, you can customize your virtual surfer of choice by purchasing thematic runner skins. The Bus Rush Store has lots of items to improve your running performance. Get runner upgrades to improve your power-ups (including magnets and boots). Upgrade your jetpack too, and get lots of coins. You can also purchase Boards to surf mid-air and survive obstacle hits whether you hit buses, trucks or even subway trains. Bus Rush also gives you the chance of getting amazing gifts. Collect your daily gift each day and open mystery boxes to get some special rewards. Bus Rush is a very fun runner game. Download it now and start running.